DAVAO CITY, the hometown of the 16th and current President of the Philippines, and the first from Mindanao – is truly one of the ‘Muslim-friendly’ cities in the country. Its government thoroughly supports – by all means – the Muslims community thereat by ensuring at all times they can freely and comfortably practice their Islamic way of life. This has been affirmed during the dialysis training of my wife – Nur Aisa Husin, a registered Nurse – in one of health facilities in Davao City – the Nephrology Center of Davao located at Door 6, Carriedo Building, J.P. Laurel Avenue. According to her, from the day of her enrolment until she successfully finished her course, she never had experienced any discrimination from all her colleagues in work that compels her to take off her face cover during her entire course thereat. As a matter of fact, even after her training she has been accepted to work as a “reliever” and later on as a regular staff in the Center. Mostly, some people see Muslim women wearing niqaab as a threat to them and will raise dubious behavior to the one who wears it. “Alhamdu Lillaahi, here, they graciously accepted me. My supervisor even said that – niqaab will never be a reason for us not to accept you in this work. That’s your faith and we will respect and uphold it. What matter here is that you perform your professional responsibilities well and that’s fine with us,” my wife told me. “At first, the scrub suit that I wore is just short sleeves, so what I did was I just wore long-sleeved inside because I thought it’s not allowed to wear long uniform. Surprisingly, they even suggested me to just sew it so I can wear a long-sleeved uniform for my own comfort. I always go to my duty clad in abaya and niqaab. I wear face mask as replacement of my niqaab which I normally wore outside. And as a matter of fact, the Center even provides me spacious prayer room and a place for ablution where I can conveniently perform my salah. Hence, I am forever thankful to them for all the gracious acts they always showed me,” she added. Indeed, true Muslims who adhere to the correct and authentic teachings of Islam can always live peacefully and joyfully with other faiths wherever they may be, even if they are only minority in that certain place. Noteworthy to recall that in 2012, the Department of Health in Manila released a memorandum that protects and safeguards Muslim women’s religious right to wear the niqaab even inside the specialized areas within the health facilities – both private and public – across the country. The memorandum was addressed to ALL UNDERSECRETARIES, ASSISTANT SECRETARIES, REGIONAL DIRECTORS OF CENTERS FOR HEATH DEVELOPMENT, CHIEF OF SPECIAL/SPECIAL RETAINED AND RATIONALIZED HOSPITALS AND PRESIDENT/EXECUTIVE DIRECTOR OF ATTACHED AGENCIES for their information and guidance. The memorandum reads: DOH Department Memorandum entitled “Addendum to the DOH Department Memorandum 2009-0107-A: Strengthening the Protection of Religious Rights of Muslim Workers, including but not limited to Students and Trainees in Health Facilities, issued by ROMULO A. BUSUEGO, MD, MHA, DPBS, FPCS, PSGS, Assistant Secretary dated December 12, 2012, DOH protects and safeguards the Muslim woman’s religious right to wear the niqaab even inside the specialized areas within the health facilities. “Further, only a female guard or female hospital personnel may verify privately and without the presence of any male, the identity of the female Muslim,” DOH strongly emphasized in the memorandum. Moreover, sister Shameem Jailani, a registered Medical Technologist, and who just recently graduated from her Medicine course in Our Lady of Fatima University, was being rotated for junior medical internship in many major hospitals across Metro Manila such as Jose Reyes Memorial Medical, Center Dr. Jose Rodriguez Memorial Medical Center, Quezon City General Hospital, Tondo Medical Center, Pasay City General Hospital, Quirino Medical Center and San Lazaro Hospital National Center for Mental health. 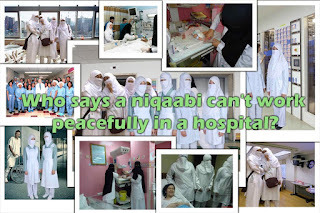 She elatedly shares her experience in wearing niqaab while studying medicine in Manila. “I’ve never felt more respected, from consultants down to medical staffs of every hospital I’ve rotated in, everyone was very adaptive and respectful with regards to our practices. Although I have had encounters with some private institutions that ask me to wear masks instead of the cloth within the premises, either way I was not placed in a situation where I have to compromise religious practices such as removing my face-cover. I also appreciate that even the value of prayer time was also recognized. And in one institution, while I was assisting a medical surgery, I was told to scrub out not because of anything negative but because it was already maghrib time and it was a very heart-warming experience that they respect us that much including our time of worship,” Shameem said. 1.) At the time of filing of application to take the licensure examination, the Niqaabi Muslim women shall be required to have her photos taken showing the whole face with complete name tag. The photos shall be pasted on the application form, permanent examination and registration record card (PERRC) and Notice of Admission (NOA). A female application processor or issuing officer shall view the face of the applicant. 2.) During the licensure examination, inside the examination room, a female room watcher/proctor shall view the face of the Niqaabi Muslim woman and compare the same with the pictures on the PERRC and NOA to ensure proper identification. This order is applicable to all Muslimat Niqaabi across Philippines and in all courses that require taking licensure examinations in PRC. Lastly, it is exhilarated to realize there are still institutions and citizens of this Republic who respect the dignity and inviolable rights of fellow human beings regardless of religious affiliation. Indeed, true Muslims who adhere to the correct and authentic teachings of Islam can always live peacefully and joyfully with other faiths wherever they may be even if they are only minority in that certain place and we are always thankful to Allaah for all of these. "NOT MERELY UZ, EVEN MALACAÑANG HAS NO POLICY PROHIBITING NIQAB"
WHEN IN MY HOMELAND, SULU! My humble dream for my homeland, Sulu!